Sleepy at the cubicle farm? 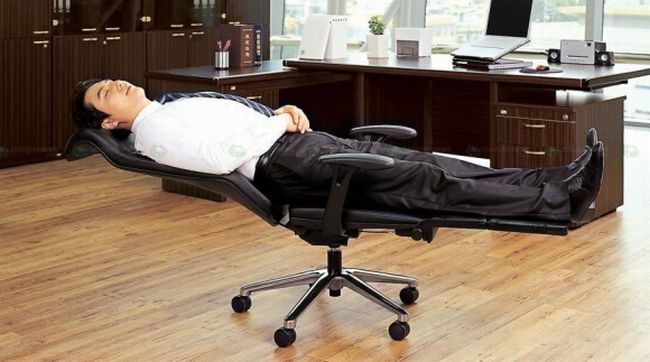 With the Thanko Anychair, you can recline this baby in under 30 seconds and be off to never never land in no time—until your boss catches you napping, of course. Currently being marketed to cubicle warriors across China and Taiwan, where sleeping at work is permissible to recharge one’s batteries, the Anychair is sweet relief for the overtaxed wage slave. Or the ultimate temptation for the lazy set; aren’t there always such people in your workplace? See, that’s the problem of the Anychair when taken out of its Asian-centric context. A short snooze might be okay over there, but in other countries, like the United States for example, taking a nap at work is the ultimate in slacker excess. Considering the job situation, it also sends the wrong signals to everyone else at the office. Unless they’re also prone to catching some shut eye between the day’s usual quota of tweets and checking their Facebook profile, arguably the two biggest drains on worker productivity today. Still, if you think you deserve a moment’s respite from your strenuous job, maybe ordering an Anychair isn’t such a bad idea. This might even be a sensible purchase for work that involves talking to people over the phone a lot (like a customer service rep) since you can just yammer on and conduct business while reclining.